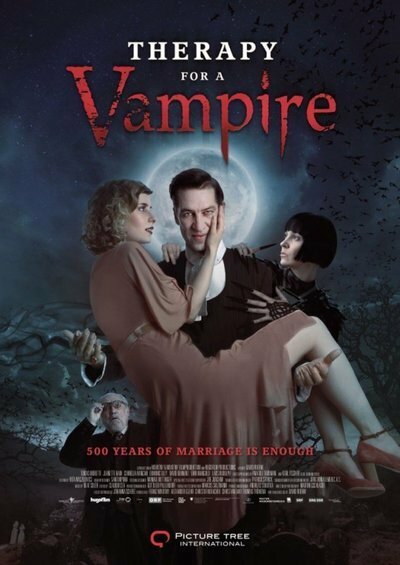 Over the years, there have been many attempts by filmmakers to put a comedic spin on the traditional vampire mythos that have been lackluster at best. Oh sure, sometimes an inspired one comes along, like Roman Polanski’s weirdo cult favorite “The Fearless Vampire Killers” or the hilarious recent effort “What We Do in the Shadows,” but more often than not, they tend to lean towards the lame and easily forgettable likes of “Love at First Bite,” “Once Bitten” or “Bloodsucking Bastards.” Even a comedy legend like Mel Brooks couldn’t pull the vampire comedy thing off when he made “Dracula: Dead and Loving It,” despite his deployment of the immortal line, “Yes, we have Nosferatu—we have Nosferatu today.” The new Austrian import “Therapy for a Vampire” is the latest film to attempt to find the lighter side of bloodsuckers and it even adds a reasonably inspired idea into the mix. Alas, the result is a thoroughly mediocre movie that is never as amusing as it should be. Set in Vienna in 1932, the film opens as no less of a figure than Sigmund Freud (Karl Fischer) himself is seeing a new patient, Count Geza von Közsnöm (Tobias Moretti), for the first time. The Count has the usual complaints—he admits that he is no good at self-reflection, has lost his thirst for life and has been married to his wife, Countess Elsa (Jeanette Hain), for so long that he has grown disenchanted with her even as he continues to pine for his long-lost first love, the one who made him who he is today. The joke, of course, is that what might sound like psychobabble from other patients turns out to be the literal truth from the Count because he is a vampire. Oddly, the great Freud doesn’t quite twig to what is really going on with his patient—he is so absorbed in his notes, for example, that he fails to notice that the Count is actually floating a few feet above the couch during their sessions. Meanwhile, Freud has also employed local artist Viktor (Dominic Oley) to produce a series of illustrations based upon his dreams. Viktor, as it turns out, has a few issues as well—every time he paints a portrait of his fiancée, Lucy (Cornelia Ivancan), he ends up producing a glamorous fantasy image of her instead of one resembling the more sensible person actually standing before him. As it turns out, the fantasy version of Lucy is the spitting image of Nadila, the lost love whose return the Count has been pining for ever since she died in Constantinople centuries earlier. Instantly besotted with Lucy, the Count takes advantage of Elsa’s overwhelming desire to have a portrait of herself painted so that she can once again have an idea of what she looks like—the kind of thing that tends to slip the mind after centuries of not being able to cast a reflection in a mirror—by sending her off to Viktor to paint her and using that time to woo Lucy for himself. In news that will shock few of you, things do not quite go as planned and get even more complicated when Ignaz (Anatole Taubman), the Count’s long-suffering servant, becomes determined to have Lucy as well. “Therapy for a Vampire” never makes the transition from good idea into good movie. Writer/director David Rühm clearly knows his vampire mythology and elements such as mirrors, garlic and an obsession with counting wind up playing important roles in the proceedings. These moments inspire smiles here and there, but the film never quite breaks through with any big laughs, and strangely, its hook—a vampire seeking therapy from Sigmund Freud—gets pushed to the wayside after the opening scenes. The result is a film that has a few funny moments with a lot of dead air in between. This is a shame, as the actors are certainly game, giving the material everything they have and frequently more than it deserves. “Therapy for a Vampire” is like a 90-minute version of a mediocre “Saturday Night Live” sketch—the kind that makes the final cut only because they needed something to fill time.